Recounting Donald Trump’s visit to five countries in East Asia in November, this Special Forum asks if divisions across the region have since widened or narrowed. It examines political, economic, security, and civilizational divisions, stressing developments in the course of Trump’s trip and its immediate aftermath. Trump rallied his counterparts in Asia behind intensified pressure on North Korea, a new trade framework, and, somewhat amorphously, a new conceptualization of the region ranging from Japan to India. 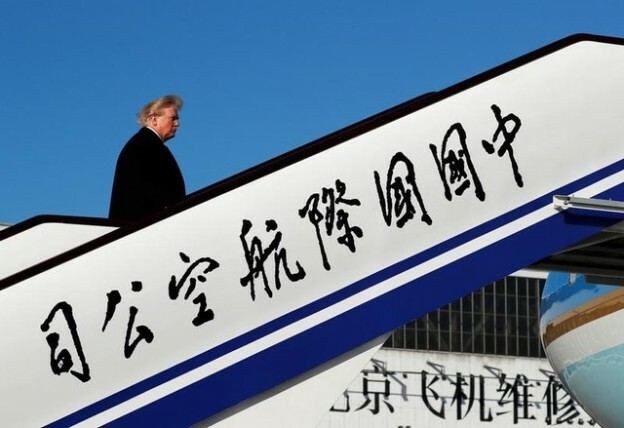 Special attention is given below to the way Japan and South Korea responded to Trump’s visits, but given that China was the most important stop on Trump’s trip, all of the authors follow closely any developments in US relations with China. In economic and political dimensions, Trump’s visits to Vietnam and the Philippines figure into the coverage too. This was an important and extensive first trip to the region by a president bent on transforming US foreign policy—a closer scrutiny was thus warranted. The White House described the trip as focused primarily on three issues: “strengthening international resolve to denuclearize North Korea, promoting a free and open Indo-Pacific region, and advancing American prosperity through fair and reciprocal trade.” Yet, in the case of Trump there are always distracting factors, ranging from tweets over the course of his 12-day travels to international tensions following the trip, affecting the countries of the Indo-Pacific. Trump’s decision to move the US embassy to Jerusalem and threaten states that condemned this move splits Washington from allies and adversaries alike. After Trump’s travels, Moon Jae-in’s visit to Beijing and Abe Shinzo’s improving ties with Xi Jinping also raised questions about Trump’s effect. Naturally, it is not easy to separate the impact of Trump’s trip from the long-term implications of Trump’s policies and rhetoric and the specific aftermath of the trip in late 2017. What makes the trip a meaningful centerpiece is the three objectives set forth by Trump—for strangling North Korea until it is ready to negotiate denuclearization or face a military attack, for pressuring states to rebalance trade to dramatically reduce US trade deficits, and to embrace a new framework for US-led regionalism presumably at China’s expense. If states distrust Trump’s penchant for bellicosity, it could lead to war with the North, compel states to refuse to change existing trade arrangements in defiance of Trump, and result in skeptical reactions to Trump’s vision of a new regional architecture. Overall, Trump’s diplomatic travel could hardly be labeled a success, but since Japan and South Korea are hesitant to voice their disapproval and China stressed the positive outcome, the results are seen as ambiguous. According to Scott Harold, Trump’s team made five major shifts in US policy toward Asia prior to his November 2017 trip. First, the president immediately pulled out of TPP, removing the regional economic component of US Asia policy. If many Asian nations saw this decision as severely weakening the US ability to counterbalance China’s economic influence, Trump’s economic pressure on them added to their discomfort. Second, the Trump team downplayed previous US focus on climate change and values such as human rights, democracy, and the rule of law, later threatening states that dared to vote at the United Nations in defiance of Washington’s highly controversial decision to move its embassy to Jerusalem. The mantle of internationalism was being seriously undercut at a time when US allies in East Asia were continuing to wrap themselves in its embrace. Third, Trump elevated the priority for stopping the North Korean nuclear and ballistic missile programs through a campaign of military pressure, economic sanctions, and coercive diplomacy aimed at compelling third countries to downgrade or cut off trade and diplomatic ties with Pyongyang. If during the trip Trump did not aggressively assert the option of preemptive military action, it loomed in the background, especially for South Korea and Japan, which were the most likely losers if war broke out on the peninsula. Fourth, the administration at times appeared to be willing to breach the firewall between economics and politics, holding US allies’ feet to the fire over trade disputes and overall trade balances, inducing fear in Japan and South Korea that Trump’s “transactional” nature could mean that Washington might downgrade its defense commitments in exchange for cooperation with China on economic issues. Harold casts doubt on the economic successes of Trump’s travel, which Trump had loudly trumpeted. Fifth, after Trump abandoned the “rebalance” to the Asia-Pacific, his appeal for a free and open Indo-Pacific apparently in opposition to China’s regional framework left many confused as to what was different. Trump’s new strategy failed to clarify the values and economic aspects of regionalism, which Trump took pains to insist were now fundamentally different. Harold describes Trump’s visit to Abe as relatively successful, coordinating pressure on North Korea, endorsing a “free and open Indo-Pacific” later bolstered by a revived version of the mid-2000s “democratic security diamond” and now renamed the “Quad.” In his next stop, where he encouraged South Koreans to buy more US weapons and reaffirmed the US commitment to stop North Korea’s nuclear program, there were more problems. During the state dinner, symbolic actions intended to signal Korea’s discontent with Japan marred the occasion, but it was not clear whether the Trump administration failed to understand the implications of the South’s actions, was caught off guard by them, or registered any dissatisfaction with bilateral South Korea-Japan issues being brought into a US-South Korea context. Harold concludes, while Trump’s big speech in Seoul largely satisfied conservatives with its strident anti-communist messages aimed at the North, progressives, inclined to see Korea’s division as the fault of the United States and to make inter-Korean relations the central policy question, were less enthusiastic. Still, avoiding threats of war, Trump managed to keep the Korea stop from badly marring the trip, as had been feared. The China portion of the trip exceeded all of Beijing’s wildest hopes, Harold adds. The countries most at odds with China were concerned by the prospect of Washington setting aside efforts to counter China’s growing regional influence in order to extract narrow, reversible promises on North Korea and trade. While none of these countries—nor others such as South Korea, the Philippines, or Australia—wants to see bad US-China relations, they are also equally fearful of the prospect of being “abandoned” or having deals made over their heads. The China stop may have given license to others to improve ties to China too, at counter purposes to US goals in forging regionalism. In the same vein, Trump’s efforts to build up Vietnam’s security and defense capabilities, bolster bilateral military ties, and encourage it to contribute to a “free and open Indo-Pacific” did not win China’s approval. Trump’s visit to the Philippines also had mixed effects, giving credence to rampant human rights violations while satisfying Tokyo, which had devoted substantial efforts to keeping Manila from slipping into Beijing’s embrace. This highlights the challenges in building a coalition of partners in the Indo-Pacific, although Harold found some success in showcasing this theme and the Quad, giving greater shape to what some critics had seen as substantial drift in US Asia policy under Trump’s watch. Yet, the challenges posed by a nuclear North Korea and a rising, revisionist China were not substantially advanced, while real or perceived US inattention or indifference to issues such as South Korea-Japan tensions, human rights in China, Vietnam and the Philippines, and the absence of a regional economic framework that includes the United States call into question the US ability to lead. Bill Grimes argues that the economic impact of Trump’s presidency on Asia continues to be mostly hypothetical. There has been a great deal of rhetoric and statement of principle along with the appointment of aggressive protectionists in key positions, but at least for East Asia, the practical reality to date has been the declaration of a few trade enforcement actions and some small-bore agreements with China on trade and investment. Thus, when Trump made his first official trip to Asia, East Asian nations welcomed him with a combination of trepidation and cautious optimism, while also moving forward with planning for a regional economic order without US leadership. Grimes, however, finds that the Trump trade agenda is a radical change in US policy, even if it is likely to get bogged down as trading partners resist pressure and work to develop new modes of regional cooperation that do not rely on US leadership—or perhaps even participation. These are likely to disadvantage US firms and consumers, instigating new contestation over the principles that underlie regional economic relations. The “whack-a-mole” approach to narrowing one bilateral deficit at a time should simply shift the geographical pattern of imports without changing the overall trade balance or it may mean less consumption and lower economic welfare, possibly leading to recession, adds Grimes. The evidence for radical change is more compelling than that for continuity. In terms of KORUS FTA, as well as for the proposed bilateral US-Japan FTA, the Trump administration is demanding that the goals of the agreements be reset as elimination of bilateral deficits, which constitutes an enormous change of strategy (not to mention economic theory). In enforcement actions, USTR has dusted off so-called “Super-301”—previously used as a weapon in the US-Japan trade wars of the late 1980s and early 1990s—against China and threatened to take action against Chinese aluminum imports using a seldom-used national security clause (Section 232) of the 1962 Trade Expansion Law. The Da Nang speech was a clear statement of Trump’s trade agenda. While insisting that trade partners must eliminate unfair trade practices, the president made clear that success would be measured in bilateral trade imbalances, and that East Asian countries were on notice that their “chronic trade abuses” were unacceptable and would be punished by US trade action. The response to such pressure was not positive. Aso Taro announced that Japan had no intention of negotiating a bilateral FTA with the United States if the purpose were to reduce the Japanese bilateral surplus. South Korea has reluctantly agreed to renegotiate KORUS FTA, but its former lead negotiator has been quoted as saying, “How can we trust the United States?” The Chinese government expressed no willingness to discuss bilateral deficits or to make more than marginal liberalizations. So far, Trump’s election and his visit to East Asia appear not to have reinvigorated the RCEP negotiations. This was somewhat surprising, as many had assumed that the RCEP is a vehicle for Chinese leadership in the trade realm. Instead, the BRI appears to be the chosen tool for establishing Chinese regional leadership, as it provides opportunity for connectivity, deep integration, and expansion of regional trading networks without requiring tedious and contentious negotiations over each tariff-line or particular non-tariff barrier. Regional economies, Grimes asserts, have chosen one or both of two strategies for reducing their vulnerability to US trade pressure. First is the emergence of TPP-11, now renamed the Comprehensive and Progressive Agreement for Trans-Pacific Partnership (CPTPP). The members announced a tentative agreement on November 11, before Trump had even left Asia. Economic analysis shows that TPP-11 is a pale shadow of the original TPP in terms of its economic impact, but it serves several purposes for Japan and other leading members. In particular, it is a rebuke to the Trump trade agenda, making clear its members’ preference for a multilateral, rules-based regional approach rather than arranging themselves in a web of uncoordinated bilateral agreements and making themselves subject to the transactional approach of the Trump administration’s trade team. At the same time, by keeping the TPP agreement and structure mostly intact, it invites the United States (and China) to join at a later date. Grimes finds the rhetoric of a “free and open Indo-Pacific region” that Trump presented in Da Nang to be hollow versus the practical vision of TPP or TPP-11. Given that there remain many in Asia who are suspicious of Chinese intentions and prefer to build alternatives to a Chinese-led regional order, he argues that there is no substitute for the role that the US state and economy have previously filled (even if not always perfectly or selflessly). For now, Japan and the other TPP-11 members have chosen to pursue multiple strategies to prevent the creation of a regional rules vacuum and to minimize reliance on a rising but unpredictable China. Shin Beom-chul argues with relief that Trump wrapped up his East Asia trip without making unexpected moves, but also that he made little progress in achieving his primary objective of taking one step further toward resolving the North Korean nuclear and missile problems. The security environment on the Korean Peninsula remains much the same as before Trump’s trip, he concludes, as the focus of the trip was more on compromise and economic cooperation, than on confrontation and security issues. What Trump agreed with his South Korean and Japanese counterparts on forging close cooperative ties in resolving the North Korean nuclear issue had already been agreed to and implemented prior to their summit meetings. Although China promised to ramp up pressure on North Korea, this does not guarantee the full implementation of China’s sanctions against the North, warns Shin. The Korean government’s anti-war stance seems to be reflected in the agreement with Trump. Contrary to the predictions made prior to Trump’s visit, the South Korean government did not have to face further pressure from the US side. The two sides settled the issue for the time being by focusing on how to amend the KORUS FTA and reaffirming their commitment to the promotion of fair trade. It appears that Trump’s friendly gesture and remarks were affected by the South Korean government’s promise to increase investments in the United States. In fact, South Korean government agencies and companies announced plans to invest $57.5 billion over the next four years, a boon appreciated by Trump. Attention centered on how Washington will nurture a new US-China relationship with the beginning of Xi Jinping’s second term. Since taking office, Trump has been different from his predecessors in dealing with China, explicitly pointing out that China is the main culprit in the weakening of the US economy and vowing to retaliate against China for its unfair trade practices and currency manipulation. He also underscored China’s role in resolving the North Korean nuclear problems, saying that China is not taking due responsibility regarding the issue. Some also eyed the possibility of a big US-China deal to break the North Korean nuclear deadlock. Yet, threats of implementing secondary sanctions against China and on triggering the “Super 301” provision were avoided. There was concern that Trump would recognize China’s influence in North Korea in return for China leading efforts at denuclearizing North Korea. Sensitive issues such as the reduction of US forces stationed in South Korea might be addressed, Shin warns. The re-designation of North Korea as a state sponsor of terrorism was already anticipated during Trump’s trip. The decision was appropriate, considering that this was part of US efforts to employ every possible measure to place pressure on North Korea. China and Russia have opposed imposing stiff sanctions against Pyongyang, a stance based on their strategic calculations to utilize the North Korean nuclear issue to serve their national interests. Yet, Beijing has temporarily suspended the operation of an iron bridge linking China and North Korea. Given the history of Beijing easing sanctions against Pyongyang over time, its commitment to implementing sanctions against North Korea is likely to be ineffective in the years ahead. The South Korean government has made significant efforts to improve strained South Korea-China relations. For instance, it reached an agreement with China regarding the THAAD deployment issue on October 31. The summit produced some results, but many problems remain to be tackled, including the grudge harbored by both regarding the THAAD deployment and their failure to release a joint statement. The summit showed China’s stance coupling denuclearization and blocking American influence in the region. The US-Japan summit had limited implications, but provided the two sides with an opportunity to reaffirm the fact that they are going in the same direction in implementing their foreign policies. Trade relations attracted the most attention at the summit. Trump appears to have toned down his critical stance on the Japanese government’s trade policy, which seems to be due to Abe’s promise to invest more in the United States in the years ahead. Trump and Abe also reaffirmed their shared views on the resolution of the North Korean nuclear problem. The core idea of Trump’s Indo-Pacific strategy is to make the United States, Japan, Australia, and India lead efforts to promote the rule of law and freedom of navigation throughout the Indo-Pacific region. Many think that Trump’s strategic calculation to constrain the rise of China in the region is behind the Indo-Pacific strategy. The idea is likely to be adopted as the centerpiece of the US regional strategy, concludes Shin. Shin asserts that the new Indo-Pacific strategy overlaps with Obama’s rebalance strategy in promoting a free and open Indo-Pacific, and emphasizing the rule of law and freedom of navigation. Trump, however, has not devised a systematic approach. At the moment, Washington shares an understanding of the concept in a broad sense with Japan and Australia. But India’s stance remains ambiguous. It is also important to address South Korea’s concerns to regarding the Indo-Pacific strategy; there are different views in the government regarding South Korea’s participation. Some warn of the possibility of Washington using this geo-strategy as leverage against Beijing in the region, which can jeopardize South Korea-China relations and lead to Beijing’s non-cooperative attitude in resolving the North Korean nuclear problem. Focusing finally on the US-South Korea alliance, Shin argues that the details of US extended nuclear deterrence on the Korean Peninsula need to be defined further, as well as the conditions for the transfer of wartime operational control (OPCON). Both the US and South Korean governments have agreed on a "condition-based, rapid transition of wartime operational control," but Shin warns that the concepts of a condition-based transition and rapid transition might clash with each other. Kazuhiko Togo argues that the idea of “America First” could have deep civilizational implications, undercutting “universal values” while adding momentum to recent assertiveness about distinctive civilizations by the leaders of the other great power players in Northeast Asia. Leaders of Japan, China, the United States, and Russia have expressed their primary national goals in a most simplistic manner: Abe’s “Take Back Japan”; Trump’s “America First”; Xi’s “China Dream”; and Putin’s “Gosudarstvennost’.” Each slogan aims to create a strong, rich country, where power is less checked and can be wielded more forcefully. Putting the emphasis on Abe, Togo considers the impact of what each leader is advocating and Abe’s responses, and whether civilizational differences are widening. Abe wants Japan to overcome the consequences of a defeated country both mentally and economically. Achieving this requires escaping the legacies of the occupation period and becoming an autonomous (self-standing) power and civilization. Freed from the occupied country’s mentality, “Japan can become Japan again,” Abe reasons. An important step was taken toward ultimate reconciliation between Japan and the United States while Obama was president. This set aside the identity barrier that most seriously stood in the way of asserting Japan’s identity. Togo finds that Abe succeeded in strengthening Japan’s greater autonomy also through reinterpretation of Article Nine. Abe’s objective was to establish good personal relations with Trump, allowing him to cope with difficult issues and to be engaged in some future-oriented talks. But in policy areas, Abe had to broaden his scope. On North Korea, Abe’s primary thinking was to pressure Kim Jong-un effectively. In addition to Trump, he needs other partners. In meeting Trump, Abe’s realist policy dictated that he acts energetically so that the voices of the international community are united to pressure North Korea to change course. Abe keeps on stating that “Now it is time to pressure North Korea.” In identity terms, this showcases a pro-active leader. In contrast, Trump’s leadership in the area of civilizations is weakest because he is unable to define strategically what he really means by “America First” other than obtaining immediate gains. His domestic command is weak, which makes his identity position even weaker. So far, the best relationship he has is with Abe, then there is uncertainty with Xi, and, despite the personal chemistry, state-to-state relations with Putin are difficult. From the point of view of identity and civilization, Trump’s way of seeking immediate gains is widening the divide with Xi and potentially with Putin, and maintaining it with Abe. In foreign policy, the issue of honor and identity has drawn widespread attention. Abe has been known to have a somewhat simplistic conception of “protecting pre-war Japan’s honor,” and he is faced with the sudden proliferation of history-related initiatives led by China and South Korea. They include: the opening of the “Tokyo Trial Research Center” at Shanghai’s Jiaotong University; the opening of the “Chinese Comfort Women Problem Study Center” at Shanghai Normal University; a further application to the UNESCO related to “comfort women” after its acceptance of a Nanjing massacre application in 2015; proliferation of statues of Chinese and Korean “comfort women” and forced laborers in China, South Korea, the United States, Europe, and elsewhere; Moon Jae-in’s reexamination of the December 2015 agreement on “comfort women;” and the South Korean High Court’s guilty verdict against Professor Park Yuha of Sejong University for defamation. Arguably, Togo says, the Sino-Korean war against Japan on history, now conducted on a global scale, has reached its peak in the postwar era. We are likely to see in Abe’s further responses to Xi and Putin—and some would add Trump, given his three-decade old accusations against Japan for unfair trade and other transgressions—how Abe painfully strategizes against this apparent encirclement. The civilizational divide is widening just as Abe is intent on asserting pride in Japanese civilization in a new manner. Japan cannot simply abandon multilateralism and now needs to give more serious consideration to other regional multilateralism. Given Trump’s exclusive bilateralism in defending US national interests at the expense of any multilateralism and regionalism—as illustrated by the collapse of TPP—what China has been achieving with its BRI in Japan’s economic sphere emerged probably for the first time as an important area for consideration. An effort for “deterrence” first, and combined with it, “dialogue” became Abe’s active policy toward China. Here again his security-foreign policy became inseparable from his policy of identity. From May to June, despite his difficult domestic situation, Abe began taking concrete steps to express his interest in a more cooperative policy toward BRI. Adoption of this strategic policy was taken, despite, or perhaps because, of the rising tensions on historical memory between Japan and China. Cooperation on BRI is just the first step in expected efforts by both countries to find common areas for a possible win-win solution to their existing problems. This would be a more strategically oriented option, where power and interests count, facing newly emerging encirclement by China and South Korea with little commonality in the area of identity. Abe is at a crossroads over whether he will be able to crash through the past barriers with Russia. He has made significant efforts to find the optimal point between narrowly defined destructive nationalism and harmonious identity with China. His efforts have not produced ground-breaking results, other than a little warmth in personal relations, which has emerged recently. From the point of view of identity and civilization, relations with the United States have stayed neutral, with Russia they are at a crossroads, and negative factors prevail with China (and South Korea), with limited prospect of finding a common Asian identity.